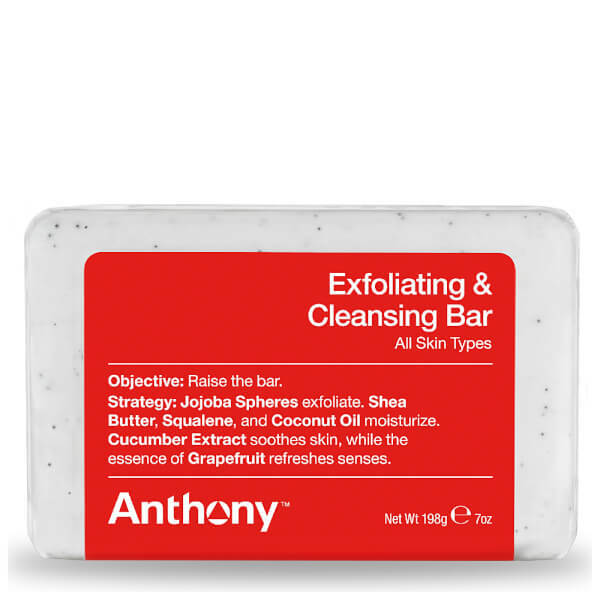 Revitalise skin from top to toe with the Anthony Exfoliating and Cleansing Bar; a dual-action soap bar for the face and body. Infused with skin-polishing Jojoba Spheres, the luxurious formula effortlessly eliminates impurities and buffs away dead skin cells, whilst moisturising Shea Butter and Coconut Oil restore softness and suppleness. 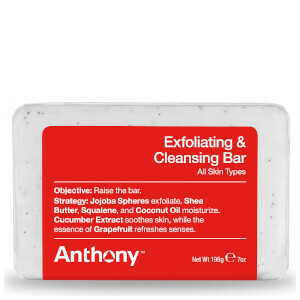 Suitable for all skin types, its dose of Cucumber Extract and Grapefruit fragrance promise to leave the face and body feeling soothed, refreshed and hydrated. Moisten the bar of soap. Massage onto wet skin in a circular motion to create a rich lather. Rinse thoroughly. Use morning and evening. Sodium Palmate, Sodium Cocoate, Water, Palmitic Acid, Fragrance (Parfum), Titamium Dioxide (CI 77891), Glycerin, Sodium Chloride, Hydrogenated Jojoba Oil, Simmondsia Chinensis (Jojoba) Seed Oil, Butyrospermum Parkii (Shea) Butter, Squalene, Tetrasodium EDTA, Tetrasodium Etidronate, Cucumis Sativus (Cucumber) Fruit Extract, Iron Oxides (CI 77492), Citric Acid.